As its name suggests, St Bartholomew (also known as St Sepulchre) is outside the city walls. Two late C17 engravings by John Dunstall (6 p277) show a round nave and apsidal chancel, which were perhaps C12. These are entitled ‘A Temple by Chichester’, which may seem misleading, but in the early C17 St Sepulchre was known as The Temple (4 p112) and, in a will of 1495, St Bartholomew was called the round church (ibid), so clearly all are the same. The name ‘Temple’ presumably derives from the plan, on the analogy of the Temple Church in London, as the church never belonged to a Military Order (3 p86). Dunstall shows the church on a mound like the present one, so the site is probably unchanged. After destruction in the siege of 1642, the church was not rebuilt until 1824 to 1832 and even then, the long period needed to build such a modest church was caused by money problems (5 p266). During this time, however, the parish had remained in being (ibid p262) and the parishioners still used the graveyard (Dallaway I p195). The architect of the new church was G Draper (GRI). It is conservative in design and recalls nonconformist architecture. Draper also designed the local Primitive Methodist Chapel (Colvin 3rd ed p322, but not in the 4th ed). The west facade of pale brown sandstone has a large round-headed doorway and window, flanked by pilasters supporting a small pediment, with small circular openings above round-headed niches each side. Adelaide Tracy shows a two-stage Grecian tower (1 p59), perched rather awkwardly above the west gable and now gone. The grey side-walls of galletted flint have round-headed windows. A small chancel-like projection, separated from the nave by a plain round-headed arch, was in fact built as a vestry. However, little remains of Draper’s interior, which had provision for galleries if required (ICBS). The Victorians did not favour such churches and two attempts at improvement are known, though that in 1878 under H E Rumble (B 36 p202) may not have got beyond tendering and no details are known. In 1894 G C Vernon-Inkpen and Swinburne (WSRO Ep I/40/5577) remodelled the east end. The vestry was fitted out as a chancel, with a new vestry to the north. After legal problems concerning the ownership of pews, occasioned by the provisions of the Act of Parliament governing the rebuilding, new seating was provided (ibid). Despite the unpopularity of galleries, the west one may date from then. By 1920 Victorian architecture was as out of favour as Draper’s had been a generation before and the church was in serious disrepair. With a lack of urgency rivalling its building in the 1820s, plans by M Gill were drawn up in 1921 (WSRO Ep I/40/3056), but not until 1929 was the most conspicuous change made, the removal of the tower (WSRO Ep I/40/2604), thereby accentuating the impression of a nonconformist chapel. Gill remodelled the interior and added painted decoration to the flat ceiling with coved edges, though the wooden strips arranged in simple geometrical patterns may date from 1894. 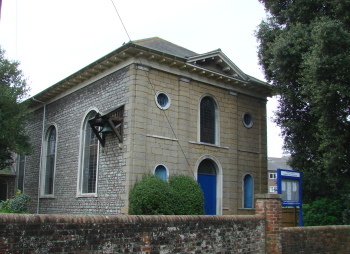 The church ceased to be a parish church and was used for many years by the now defunct Chichester Theological College. After a period of uncertainty, it has become the Chaplaincy Centre of Chichester College. Font: Showy octagonal, with marble shafts and foliage capitals, 1885 (CDK 1885 pt 2 p156). Reredos: Designed by Gill. Tall, gilded and painted.